Hair transplantation is the advanced and globally accepted procedure for hair restoration. Medical science has introduced various advancements in this field to refine the results and to make the results stay longer. Bio- FUE is also one step ahead of the popular FUE procedure. Bio FUE is the combination of bio Therapy and the FUE procedure. Under FUE individual hair follicles are extracted and implanted in the scalp and under the bio therapy growth rich platelets are injected in the scalp to stimulate the growth of hair. The basic procedure for bio- FUE is similar to the follicular unit extraction means the extraction and transplantation of healthy and loss resistant follicles has been done in the same way but in Bio – FUE growth factors are injected in the scalp for better results. 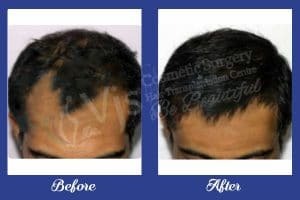 In this technique patient’s own blood is drawn out and the growth factors are separated from blood and injected in the transplanted area for the great results for hair growth. This procedure is done to strengthen the transplanted and existing hair follicles. Regenerative cells or the growth rich platelets are infused into the donor site of FUE so that healing can be rapid and growth of transacted hairs is promoted. Even the extracted follicular units are bathed in the growth factor rich culture medium so that cell death can be reduced and to improve the yield of transplanted follicular units. Even the regenerative cells are injected in the transplanted area as the final step of the surgery for the faster healing, rapid growth of transplanted hair and to improve the quality and density of both transplanted and non transplanted hair. Patients with the limited donor supply and the scalp elasticity are also considered ideal for this procedure. It makes faster to the healing process of both donor and transplanted area. It stimulates the stem cells of the transplanted hair. Dr VJ’s cosmetic and hair transplantation centre Andhra Pradesh, is pioneers of Bio- FUE Hair Transplant Surgery in Vizag and we provide this treatment at very affordable rates.